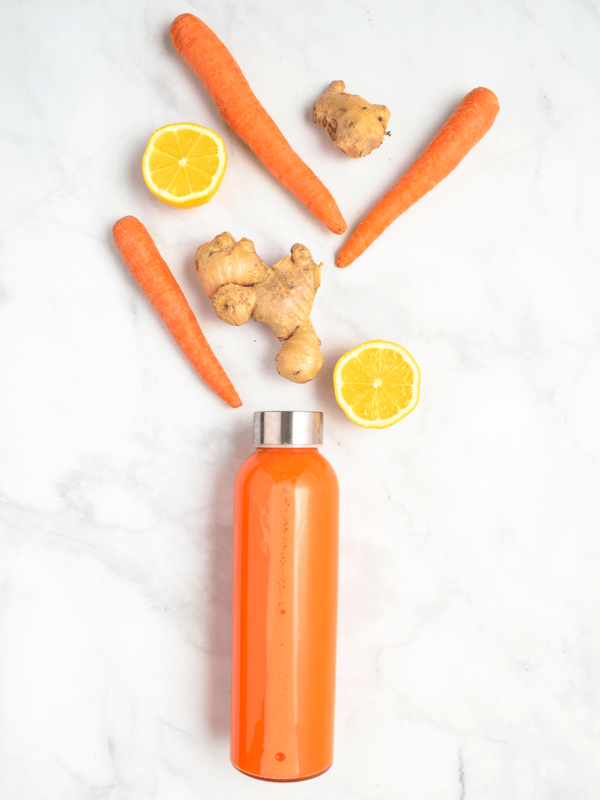 This blender carrot juice recipe is light, refreshing, and ready in just 5 minutes! Carrots are low in calories and packed with revitalizing nutrients like beta-carotene. Their high water content and lightly sweet flavor makes them perfect for a nutritious juice. But what if you don’t want to splurge on an expensive juicer? This recipe will show you how to make a hydrating and nourishing carrot juice using just a blender! While carrots contain a wide range of vitamins and minerals, they are most known for their beta-carotene content that gives them their beautiful color. Beta-carotene is an antioxidant that is converted to vitamin A by our bodies and it comes with a variety of potential health benefits. Oxidative stress contributes to the aging process of our brain and our bodies as a whole. Antioxidants like beta-carotene can help combat the free radicals that cause oxidative stress. It is commonly known that carrots are great for eye health. This is mainly due to their high beta carotene content. Carrot juice isn’t just a delicious and refreshing drink, it might actually make that beta-carotene in the carrots more readily available to our bodies than just eating whole carrots. Rinse and dry the carrots, lemon, and ginger. Remove ends from carrots and cut lemon in half (you can also use bottled lemon juice instead). Peel the carrots and ginger piece. The ginger and lemon add some extra flavor to the juice and give it a refreshing finish. Fresh Tip: Be sure to peel the carrots before blending. If you leave the peel on, your juice will have a gritty texture. Add the ingredients to your blender. If you don’t have a powerful blender you may want to blend just the water and carrots together first so they can get fully broken down. Fresh Tip: The ice helps to keep the juice cool while blending. Heat can degrade some of the nutrients in the juice. Blend on high until juice is smooth and carrots are fully liquefied – about 60 seconds. *Optional: Depending on your blender or preferences you may want to squeeze the juice through a nut milk bag for a super smooth texture. You can also skim some of the foam off the top after blending for a smoother texture. Fresh Tip: Use less water in step 2 if you’re straining with a nut milk bag. Use about 1/2 cup water or as much as is needed to get the carrots to blend. A high speed blender like a Blendtec or these top Vitamix blenders can completely liquefy the carrots so straining is unnecessary. This carrot juice recipe is one of my favorite blender juices along with my green goddess juice. They are just so easy to make if you have the proper blender. That’s why I’ve included both the recipes in my 5 best juice cleanse recipes! But what if you want to enjoy some rejuvenating fresh juice and you don’t have a high speed blender or a juicer? You can always buy your juices, although they don’t come cheap. You also want to steer clear of the pasteurized juices you’ll find in supermarkets because that process can degrade their nutrients. If you don’t have a local cold-pressed juice shop then I recommend checking out Jus By Julie. They have a great assortment of flavors, have frequent discounts, and they ship nationwide! They also have some amazing juice cleanses if you really want to boost your health and lose a few pounds! Just be sure you are familiar with the proper way to do a juice cleanse. A light and refreshing carrot juice packed full of revitalizing nutrients. Made in a blender and ready to drink in under 5 minutes! No juicer needed. Wash and dry the fresh produce. Cut ends off of carrots then peel them. Remove peel from a 1/2 inch piece of ginger. Halve the lemon for squeezing. Add water, carrots, ginger, lemon juice and ice to a high speed blender. Blend on high for about 60 seconds until carrots have been fully liquefied. *Optional: Depending on your blender or preferences, you may want to strain and squeeze the juice through a nut milk bag for an extra smooth finish. If you’re doing this step use only 1/2 cup of water in step 2. Be sure to peel the carrots or the juice will have a gritty texture. A high speed blender like a Vitamix or Blendtec is capable of making this recipe into a smooth juice texture without the need to strain at the end. I personally use this blender. The ice cubes help keep the juice cool while blending. Too much heat can degrade the valuable nutrients. Gonna drink this daily for my skinn thanks.